Wonderful pair of galaxies by the bowl of the big dipper. Click image for larger version (1440x968). 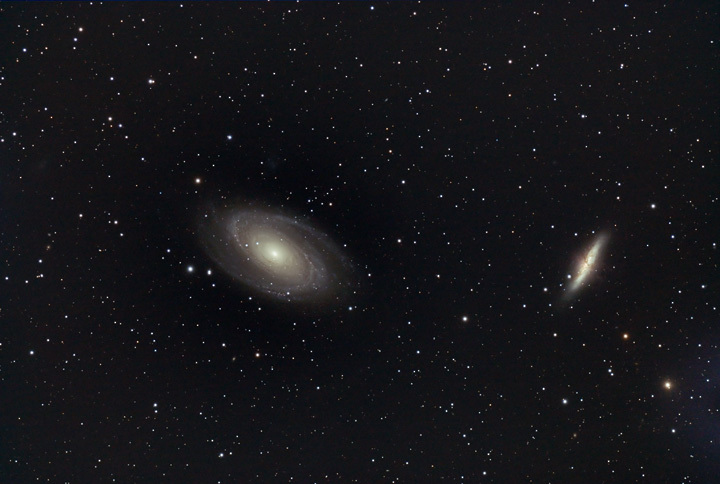 For more information about these galaxies see SEDS or Wikipedia. Taken the night I watched the Flint Hills burning, I was unable to exposure longer due to an approaching fire line. The fire was more light pollution problem than risky conditions. Despite the situation I was surprised how well the image turned out. Poor matching of the dark frame temperature lead to the blueish area lower right. Calibrated with bias, dark and flat frames. Initial RAW conversion, registration and stacking in ImagesPlus. Additional adjustments in Photoshop CS2, Gradient xTerminator and Neat Image noise reduction.